Use this Home Buyers Closing Cost Calculator to help estimate the total cost to purchase a home. 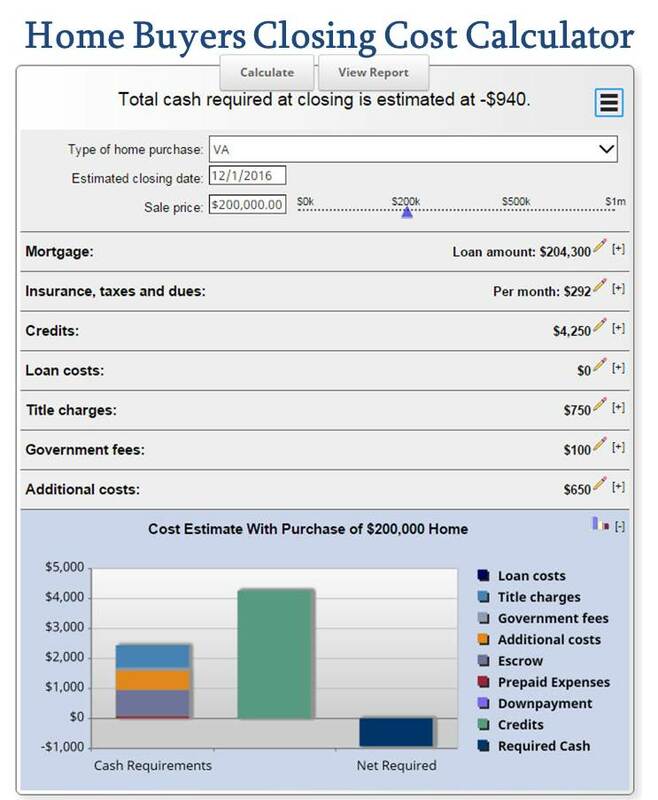 Closing Cost Calculator for Home Buyers, buying a house with Cash, Conventional Financing, FHA Loan, or a VA Home Loan. Please remember that this is an estimate, the actual fees and expenses may change depending on a variety of factors including the actual closing date. This also serves as a traditional home loan calculator, with many more details, simply fill in the purchase price, down payment, and interest rate and it will calculate your monthly mortgage payment. Definitions are listed below the Home Buyers Closing Cost Calculator. Complete information for: Mortgage, Insurance, taxes and dues, credits, loan costs, title charges, government fees, and other additional costs. Definitions include explanations, mortgage questions regarding possible closing costs, prepaids, taxes, insurance, and calculations used to create this estimate. Looking for a different one? More Financial Calculators Here. Feel free to use current Mortgage Rates in this mortgage calculator. You may email the results by clicking on the three-line icon in the upper right hand corner of the Home Buyers Closing Cost Calculator.